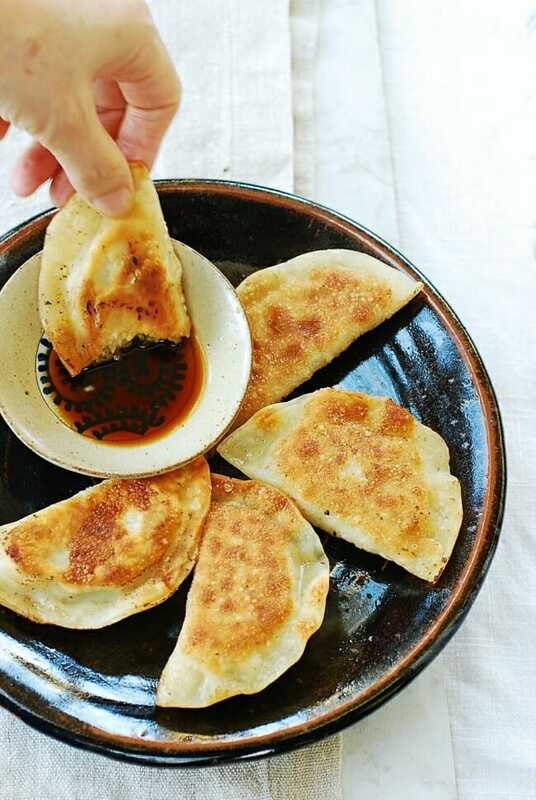 Learn how to make Korean dumplings (mandu) with this easy-to-follow recipe! Dumplings are much easier to make than you think, especially with store-bought dumpling wrappers. Delicious and versatile, homemade dumplings are well worth the effort! I’ve been making some variation of this Korean dumpling recipe for decades. Korean dumplings are called mandu (만두), and they are so delicious and versatile! 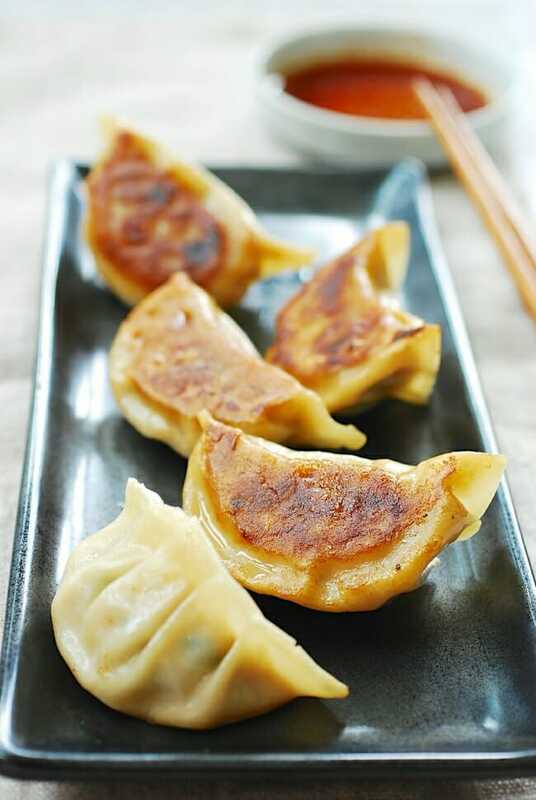 Hope you’ll try making your own dumplings at home with this easy step-by-step mandu recipe. Homemade dumplings are always worth the effort! When I make mandu, I make in large quantities and freeze them for later use. My mother used to make hundreds of these at a time, and so did my my mother-in-law. We Koreans grew up with fond memories of watching our mothers make these tasty little dumplings, being a helping hand at times, and devouring them when they are cooked. It feels so good to have bags of frozen dumplings in the freezer. They are quick and easy to cook as a delicious snack, appetizer, or a light meal! There are many variations of mandu. Depending on the filling ingredients, they are called gogi mandu (고기만두, meat as the main ingredient in the filling), yachae mandu (야채만두, vegetables), saewu mandu (새우만두, shrimp) , kimchi mandu (김치만두), and so on. Also, depending on how they are cooked, they are called jjin mandu (찐만두, steamed), tuigin mandu (튀긴만두, deep fried), gun mandu (군만두, pan fried), or mul mandu (물만두, boiled). My favorite is steamed, followed by boiled, but my children prefer either deep-fried or pan-fried for the crispy skins. 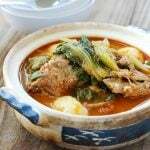 This mandu recipe was originally posted in September 2009. That was a long time ago! Thanks to you guys, it’s been very popular! Here, I’ve updated it with more information, new photos and minor changes to the recipe. Korean dumplings are filled with a mixture of various meats and vegetables. Mandu is so versatile that you can use any type of meat you like (or none at all). I typically use two types of meat/seafood for the complexity of flavor: pork and beef or pork and shrimp. 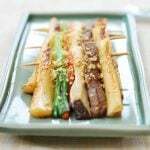 Common vegetables for the filling include baechu (배추, napa cabbage), green cabbage, kimchi, bean sprouts, mushrooms, zucchinis, garlic chives, onions, scallions, etc. 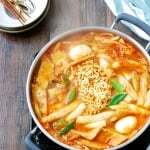 Tofu and dangmyeon (당면, sweet potato starch noodles) are also common in Korean dumplings. I like the meat and vegetable ratio in this classic recipe. It creates a filling that is moist and juicy and has a good texture, but you can increase or decrease any ingredients to your liking. If you want to taste the filling to make sure it’s well seasoned, microwave a teaspoonful of it for 20 to 30 seconds and taste it. Adjust the seasoning as necessary by adding more salt or soy sauce, or add more ingredients if it’s too salty. Season lightly if you plan to serve the dumplings with a dipping sauce. 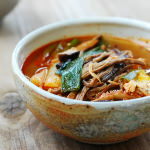 In this recipe, I used ready-made dumpling wrappers I bought at a Korean market. You may be able to find dumpling skins at your local grocery stores. 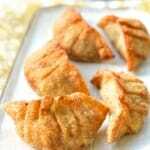 If you want to make your own wrappers, see my saewu (shrimp) mandu recipe. The number of wrappers in a package varies widely, ranging from 20 to 50. For this recipe, you’ll need about 40 to 50 round wrappers, depending on the size of the wrapper and how much filling you use for each one. A dumpling can be fold in many different ways. With a little bit of practice, you can add some variation of pleats. 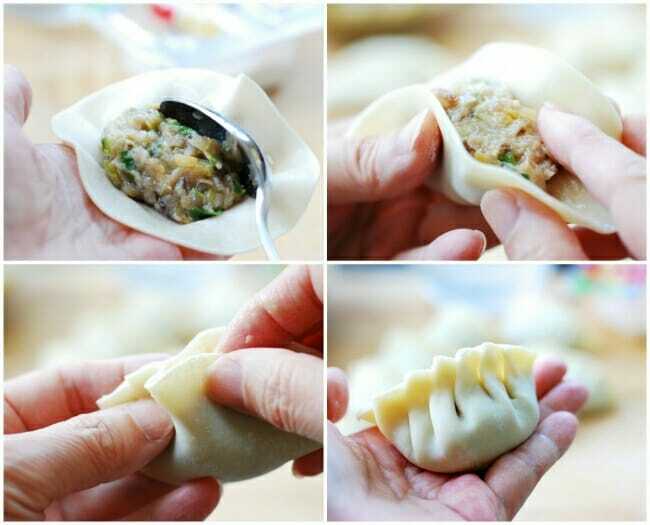 The easiest is a half-moon shape, which you can do by simply folding the dumpling wrap in half and sealing it by tightly pinching the edges together. You will need to wet the edges of store-bought dumpling wrappers so they can be glued together, a step that is not necessary for homemade wrappers. 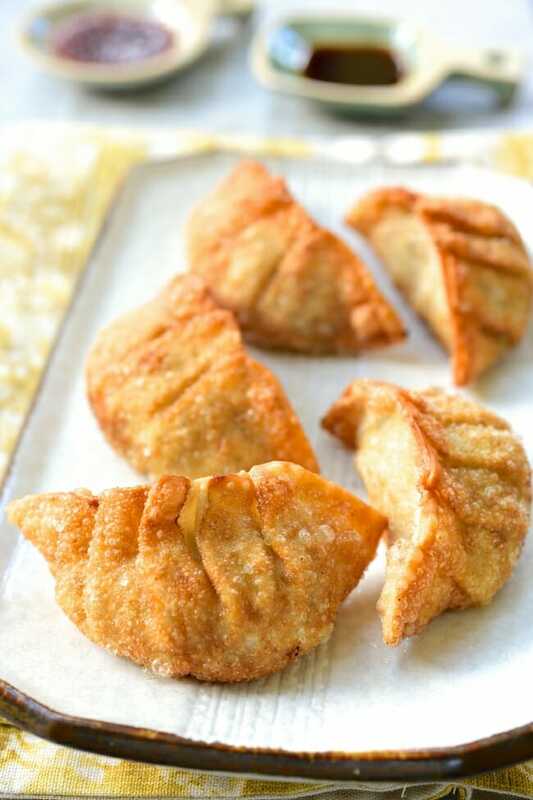 If you’re new to making dumplings, be light on the filling for easier folding and crimping. Freeze mandu on a tray with the pieces not touching each other for about an hour before storing them in a freezer bag. Otherwise, the mandu skins will get soggy from the moisture in the filling and stick together in the freezing process. You can also freeze cooked mandu the same way. Frozen mandu don’t need to be thawed before being cooked; just cook a little longer. Have you tried this recipe? Please rate the recipe below by either clicking the stars in the recipe card or in the comment section! And make sure to share your creations by tagging me on Instagram! Stay in touch by following me on Pinterest, Twitter, Facebook, and Instagram. Learn how to make Korean dumplings (mandu) with this easy to follow recipe! They are so delicious and versatile! Much easier than you think! 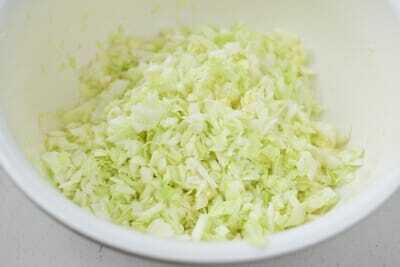 Finely chop zucchini and cabbage. In two separate bowls, generously sprinkle salt over the chopped zucchini and cabbage and set aside (for at least 15 minutes) while preparing other ingredients. (This process will draw out water, soften the texture, and add flavor.) 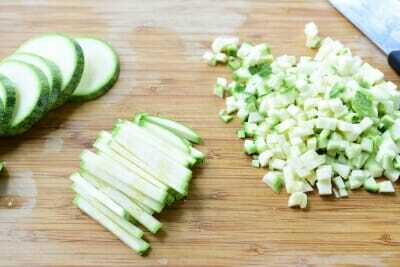 Squeeze out as much water as possible from the salted zucchini and cabbage by hand. Transfer to a large mixing bowl. Prepare all the remaining ingredients and add to the mixing bowl. Mix all ingredients well with your hand. Place one heaping teaspoonful of the filling on a wrapper. Wet the edges of the wrapper with water and seal tightly (pushing the air out with your fingers) into a half-moon shape. Repeat this process until all the filling/wrappers are used. Heat the pan with 2 tablespoons of vegetable oil over medium high heat. Add the dumplings, making sure they aren’t touching each other. Fry for 1 – 2 minutes, until the bottoms are golden brown. Add 1/3 cup of water to the pan, and cover immediately with a lid. Reduce the heat to medium low, and steam for 4 to 5 minutes. Or cook 2 - 3 minutes on each side over medium heat until golden brown without adding water. If the dumplings are frozen, cook a little longer. Heat a deep fryer or skillet with about 2-3 inches of canola or vegetable oil over medium-high heat to 350°F. Fry the dumplings for 2-3 minutes until golden brown. Steam the dumplings for about 10 minutes in a steamer (12 minutes if frozen). Make sure to line the steamer with a wet cheesecloth or cabbage leaves to prevent the mandu from sticking. Bring a pot of water to a boil. Add mandu (stirring gently so they don’t stick to the bottom of the pot) a few at a time, and cook until all of them come up to the surface. Continue to cook for another minute or two. 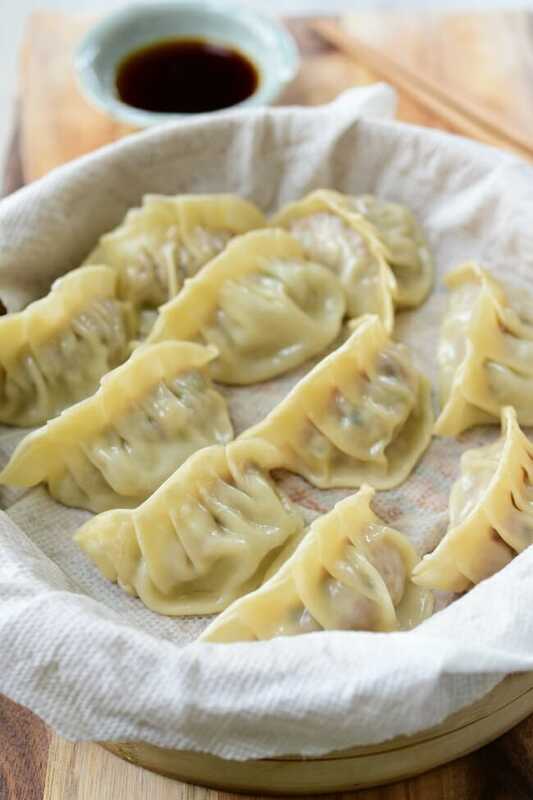 How to freeze dumplings: Place mandu pieces on a tray without pieces touching and freeze for about an hour before storing them in a freezer bag. Frozen mandu don't need to be thawed before being cooked. Just cook a little longer. This mandu recipe recipe was originally posted in September 2009. It’s been very popular, but I’ve updated it here with more information, new photos and minor changes to the recipe. 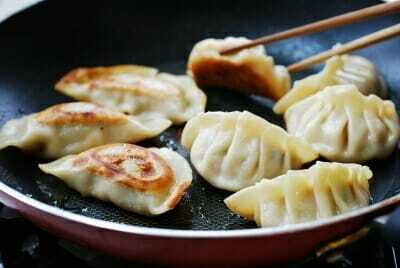 I am eager to know if Yachae Mandu ( Vegetarian dumplings without any meat) can be made without egg? If so, could you suggest how to go about that? Thanks for visiting my blog. Yes, you can make mandu without egg. You can add tofu and more flour/corn starch for binding. See my Kimchi mandu post for using tofu in mandu. Also, you can use finely chopped (or grated) onion that is stir fried until all liquid evaporates. It will look like a paste and works as a binding agent. Hope this helped. I would love to hear from you. Pavel – Thank you for catching it. It’s a bad habit from my day time job. How many mandus does this recipe make? 40-50? 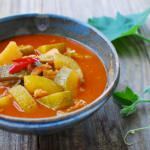 Fin – Sorry about the delayed response, but I am so happy to hear that you will try this recipe. Hope you enjoy as much as my family does! Thanks for the visit and nice words. Always wondering what is the best way to squeeze out the ginger juice. What is the way most Koreans do? Thanks for posting many yummy recipes. Supranee from Thailand. 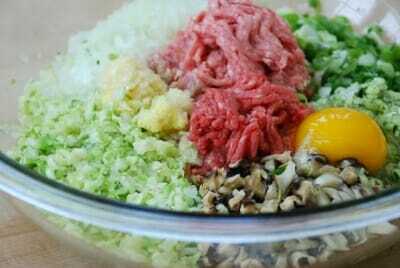 Supranee – I just grate or finely mince it and then squeeze it by hand. Thanks for stopping by. Happy cooking! I just came across your blog and have already learned so much! After making mandu and freezing it, when ready to prepare to eat, how do you suggest doing that? Putting in oven… back in skillet… etc. Thanks! I think, fried dumpling more best than steam dumpling. When you freeze uncooked mandu, do you have to thaw when making mul mandu or can you just put them directly in boiling water for a bit longer??? No, you don’t need to thaw. Just cook them frozen for a little longer. Thanks! Fantastic, thanks very much, I lived in Korea for a year, and m now back in nz, in a small town, so no access to yummy Korean restaurants! I made ur recipe for mandu…..and they were perfect, brings back memories!! Thanks again! So happy to hear that, Rebecca! Thank you so much for taking the time to write me the feedback! do we have to add scallions? For the sauce do you need the gochugaru? If so, is there an alternative if you don’t have that? Just omit it. It will be fine. Enjoy! Yes it’s common to use those soaked (or cooked) and chopped starch noodles in mandu. You can add that to this recipe if you’d like. Thanks for stopping by!! My mother use to make the mandu wraps. Do you have a recipe you can share? About 50 years ago a lady from Korea gave my mom a modified recipe of Mandu. It included ground pork, onion cabbage. spices. I know it used 1 LB. of ground pork, but I can’t remember how much cabbage or onion, or how much or what spices. Could you help me with some measurements please. I would love to make some for Christmas.. When I was stationed at Kwang Ju Air Base in 1968 and 1970 I lived on what we called yaki mondos. Now that I know the correct spelling and pronunciation I finally found a recipe (yours) and can make my own. Thank you, thank you, thank you. Also I make my own kimchi just like the little lady that owned the restaurant where I ate almost every day taught me. My first introduction to Korean food came from the wife of my Navy buddy. She was from Chinhae, S. Korea and had me over on weekends for several years. 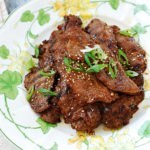 I learned to make kalbi and developed a real taste for various types of kimchee. The three of us would sit around the kitchen table making mandu. I still laugh at how she produced about twenty of them for every one I managed to make. I’ve never made homemade mandu, always buying the frozen ones from the Korean market. I think I’ll try making some this weekend. Thank you for sharing your story! Sounds like fond memories. Enjoy making them! I’ve always cooked the pork first, but see that you don’t. I fry my mandu. What additional cooking time do you recommend? Thank you! These are delicious! I added saifun once, and it turned out great!